The spoons are used more in winter months at our location, but the quality is very good as well as the weight of them makes them easier to grip than some of the lighter ones we've had before. In our industry, our customer's need a sturdy spoon because ice cream/frozen dessert texture can vary depending on temperature and humidity. Our customers have seen a difference between these heavy duty spoons vs. the medium weight that we were using previously. We'd definitely recommend using these for any ice cream/frozen dessert needs. If you buy these in bulk they are cheaper than Sams. Great for hand scooped ice cream! Perfect Size! Just watch out for the shipping. Great for tasting spoons. I go through a lot, so for the price its better for me to use disposable ones as opposed to buying metal ones and having to wash them consistently. These will stand up to soups and hot liquids. 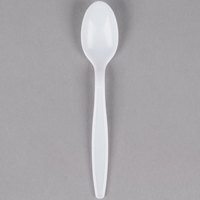 If you need a good quality, almost unbreakable white plastic teaspoon, then this is your solution. The price on this site is much cheaper than the big box stores sell them for! This spoon is made of good quality. The price is great too. Just wish shipping and handling was a little shipper . All the items I buy are for my personal use so it’s It is a little pricey for me . These spoons are great to have if you don't go through a lot of spoons.We use them for cup desserts or for ice cream in the summer.Would purchase again. We use these at a hard serve ice cream shop and have never had one break! They are awesome, best price and perfect for what we need. These are very serviceable and sturdy spoons. They are a nice shape, good looking and a good size for scooping food and eating hot soup with. We were very pleased. Thank you. If you are looking for a very inexpensive white teaspoon made of plastic for your next event this is a great option. These white plastic teaspoons. They are much better quality than the medium weight plastic teaspoons. We would highly recommend using only heavyweight plastic cutlery. I believe this is my third time buying spoons from here!! I really love these plastic spoons. They are sturdy and are such a great quality product for the price. You cant go wrong! what an awesome product! This spoon has just the right size bowl. Some other heavy weight spoons have too deep of a bowl... probably to make make seem more rigid. Great product for ice cream. Very sturdy construction, these spoons are great. The heavy weight makes these strong and perfect for both hot or cold foods. A must have for any reception or take out restaurant. Very sturdy spoons. The plastic appears more transparent than the Dixie heavy weight spoons I was buying, but it seems just as durable. Use these in our break room for coffee, tea, soups, and ice cream. Visions white heavy weight plastic teaspoon are great for any event. The spoon is well designed and very strong. A perfect addition to any picnic. Best priced plastic spoons I've seen anywhere. These are not the dinky kind that break in the middle of use. They are sturdy and thick. This white plastic teaspoons look very nice and as it says are heavy weight and very sturdy. There is no doubts that worht the price! These plastic spoons are very affordable and after using them at many events we have found them to be much sturdier than other plastic silverware. Sturdy spoon. Ships with care and when you open the box its neatly packaged. Easy to stock this way. No defects with these spoons. Will buy again! This Visions white heavyweight disposable plastic teaspoon is great. Made of strong plastic, it is sure not to break easily. And the price for 100 pieces is also great. Will use these white plastic spoons for our hard scooped ice cream, our soft serve ice cream, and our Italian ices. They are just the right strength and size. Excellent! As a family that often eats at home it's great to have these heavyweight plastic spoons for our "fancier" meals and still save on clean up. We also keep kosher so it's nice to have the spoons for use in the morning with our dairy food and then just toss them out and use metal utensils when we eat meat later in the day. The Visions White Heavy Weight Plastic Teaspoon is great the quality is pretty good for being disposable and it works as needed. Perfect for a lunch on the go. I definitely recommend this teaspoon. I really like these spoons. These are white heavy weight plastic teaspoons that don't break easily! These spoons will hold up with dishes such as pasta ice cream or even soups. This is a great idea for camping, birthdays, or any event when you may need many spoons. They are disposable and for a great price. Like the plastic fork and knife, these plastic spoons are heavy and hold up well. I won't use any other plastic silverware. Nothing comes close. Super heavy duty spoons! These are great for even harder foods such as hard ice cream. Love that they come in a big case too. Seriously heavy duty plastic spoons. I love it! They came packaged all lined up! Webstaurant is amazing! I highly recommend these spoons for multipurposes. Disposable necessities! We use these at all our church breakfast/lunch/dinner events due to the heavy weight quality, quantity, and affordability. No problems with purchase, shipping, or delivery. Great! These are the basic spoon we use for off premise catering. They are thick and hold up well to dense foods. Far superior to similar priced disposables available from our distributors. These spoons hold up very well to hot and cold foods. They are sturdy and won't bend or break when you use them. The price is great too! These spoons are very good. As the name suggests, they are heavy weight and can handle stirring hot beverages and are very good for eating (meaning you can get a lot in a spoonful.) Much better value than buying individual packets. I needed a heavy duty spoon for the hand scooped ice cream, i hate it when the spoon isn't strong enough! These are very nice and heavy duty. We ordered these for our kids. Since summer has hit, we have lost many spoons. We ordered these so they could use them and throw them away. No more lost spoons. Great price for such a sturdy plastic ware product. We love them. Honestly I was pretty disappointed by these spoons. First off mine were delivered in such a way that many of them were cracked in the process. They're also kind of large and bulky for spoons, when compared to other commercial spoons. Thank you for the review, Eric. We're sorry you feel that these were damaged. Please remember to contact our Customer Solutions team within 5 days to report shipping damages. These spoons hold up great for even the hardest ice cream. We tried a different supplier before we found these. Now we won't use anything else! These spoons were not only great for guest eating use, but were strong enough to be used to serve up some items that we didn't have specific serving spoons for. Very pleased with all of the Visions products we have tried so far. These plastic spoons work perfectly. They are sturdy and do not break easily. The large quantity was exactly what we needed. Highly recommend this product! Heavy weight plastic utensils are definitely the way to go. These are great for soups, but I also like to use them when I need a spoonful of something like butter or minced garlic to add to a recipe. Best Spoons by far! These heavy weight spoons are about an inch longer than any that we have used before! They are well-made and customers love them! These strong spoons are great! We use them for our church and family get together s. They present well. They don't break or bend and seem to be a large hit! Used the Visions Heavy Weight White Plastic Teaspoon - 1000 / Case to eat sherbet vanilla ice cream that came out of the freezer. The spoon dug through the ice cream with no trouble at all. The teaspoon is very sturdy. Purchased these for a wedding reception along with the Vision Heavy Weight White Plastic Knive and Forks. These spoons does it's job. They are hard and sturdy and we have no issues with them. Would buy more in the future. These spoons work well for us. We serve very hard, hand dipped ice cream and these spoons are up to the task. They are strong and sturdy. WHEN YOU SPEND 12 HOURS A DAY COOKING IT IS NICE TO HAVE A TASTING SPOON. THESE PLASTIC SPOONS MAKE IT POSSIBLE TO TASTE WITHOUT BREAKING THE BANK..
Great spoon to use for casual caterings. Love the heavy weight and they're sturdy enough to hold up to any entree. I would recommend these spoons and would order them again. First reason why I gave it a 5 star was the price. Second reason is that they are sturdy and are not cheaply made. What I do is if I am using them for home use then I re-wash them because they are durable. We switched from the spoons we got at resturant depot because these were SIGNIFICANTLY cheaper. The quality is great, and no one has even noticed the switch. Great product! The spoons were a nice heavy weight and very sturdy. We used them daily on a week-long vacation and they help up well; we used them for hot soup and cold cereal, and they weren't too big for the kids to eat with. I would buy them again. These are your standard plastic white teaspoons that are great for adding to to go bags that contain cups of fruit or jello! Nice spoons for tasting too!! You really can't go wrong with this spoon. It is sturdier than some platic spoons, so it doesn't break easily. We use it for soft items, like soup and gelato, so with harder items, we're not sure how it will hold up.